Some areas where Delaware has moved the needle relative to other states includes providing unaccompanied youth experiencing homelessness the opportunity to seek legal independence and live independently. State law does not specifically criminalize running away. State law provides partial or full contract rights for youth experiencing homelessness. State allows unaccompanied youth under 18 to apply for health insurance coverage on their own. There is a current state plan to end homelessness that contains a youth-specific strategy component. There is a state interagency council on homelessness. There is room for improvement throughout the metrics for the First State, with emphasis on the Law & Policy and Environment categories. Laws authorizing comprehensive supports and services for youth experiencing homelessness, addressing their educational needs, and protecting the rights and interests of youth experiencing homelessness, including LGBTQ youth, should be prioritized. Enact and fund a state law similar to the federal RHYA to provide key intervention and emergency services for youth experiencing homelessness. Enact a state law that allows youth in need of supervision to receive services without court involvement. Implement a grievance process for students experiencing homelessness that complies with federal law. As part of the state plan to prevent and end youth homelessness, include a strategy to address homelessness among LGBTQ youth. Create a state entity - such as an Office of Homeless Youth Services - that focuses solely on designing, implementing, and evaluating youth homelessness programs. Organize and maintain a self-governing youth action board or council to inform youth homelessness policy within the state. Require training about sexual orientation, gender identity and expression, healthy sexual development, or issues specific to LGBTQ youth for staff working in runaway and homeless youth systems. Ban controversial and ineffective service provision that includes conversion therapy. Promote safe and inclusive environments in child welfare, juvenile justice, and runaway and homeless youth programs by providing protections based on sexual orientation and gender identity. Download a print-friendly version of this state's scorecard. Send a message to your governor with your state's score and recommendations for improvement. Complete this form and we'll generate a personalized email and tweet for you. True Colors United implements innovative solutions to youth homelessness that focus on the unique experiences of LGBTQ young people. 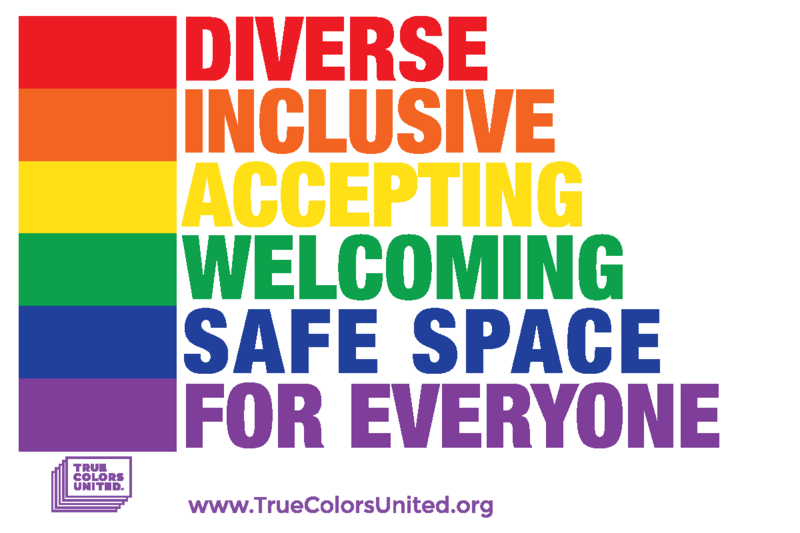 Create a welcoming environment for LGBTQ youth by using visual cues like safe space stickers, all gender restroom signs, and pronoun buttons. Browse our online shop to find the perfect items for your space! © 2019 True Colors United, Inc.